Since you're planning for future college costs, you've already overcome the biggest obstacle—getting started. 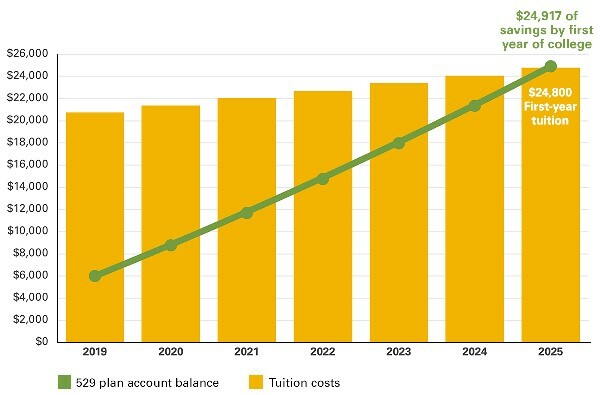 Now let's look at how you can tackle 3 more common education savings challenges—rising tuition, unpredictable market returns, and saving on a tight budget. Solution: You can't control tuition prices, but you can control how much you save from now until your child starts school. Plus, earning compound interest on your savings may help offset tuition increases. Emma's parents have saved a total of $6,000 in a 529 plan account for her education. Now that she's in middle school, they're more serious about building up that account. They decide to invest $200 a month toward her tuition at an in-state public college. Over the next 6 years, Emma's account earns a 5% average return, giving her almost $25,000 to help her pay for college. This hypothetical illustration does not represent the return on any particular investment and the rate is not guaranteed. Situation: Over the last several months, we've seen stock market volatility, creating an investing dilemma: You want to stay ahead of rising tuition costs, but you also want the money available when you need it. Solution: Consider investing strategically in a diversified portfolio. In your 529 plan account, you can choose an age-based option, which shifts your investments automatically over time. Similar to target-based retirement funds, age-based options are designed specifically to help you invest for college. These funds move your investments from aggressive to conservative mutual funds as your child gets older. If you want more control over your investments, you can shift these investments yourself, allowing you to find an optimal balance between risk and return. Situation: If you're like many families saving for college, your household expenses compete with your savings goals. Contributing $150–$200 monthly to your 529 account seems unrealistic. After all, you still need to save for retirement and pay your bills. Solution: Ask family members and friends to consider using Ugift® to contribute to your 529 account on special occasions. Small gifts can add up to thousands of dollars over the years. Your 529 Plan allows you to create a code that makes it easy for others to deposit money into your account. Graduations—from kindergarten through high school—are a natural time for family and friends to add to your child's savings. As an added bonus, you might be eligible for a state tax deduction. More than 30 states offer full or partial state tax deductions for 529 plan contributions. But don't wait until tax time—you'll need to invest in your 529 account by the end of each calendar year to take advantage of the benefits. For most people, there's no easy way to save 100% of college costs. That's why it's important to set realistic goals. Every dollar you save now may make a difference in your child's future.